As a lawyer, one of my most important jobs is telling people “No,” as in “No, you got shafted and lied about by scummy people but you have no remedy in the courthouse.” I tell that to a lot of people all the time. It makes them sad, but my destiny was never to bring joy but to bring pain. The hard fact is that you don’t want to get into any lawsuit if you can help it, and you especially don’t want to get into one that you can’t win. And when it comes to lawsuits over damage to your reputation, you mostly can’t win. You mostly can’t win because of our First Amendment and how we lean over backwards to let people speak their minds – well, we do, and the courts do, even if institutions run exclusively by liberals (such as academia) don’t. Remember the “Clock Boy” case? He sued Ben Shapiro for defamation, lost because we can still express our opinions in America even if people don’t like them, and ended up with a big judgment against him (I was one of the lawyers on Ben’s legal team). But then there are some cases, like the one that drove a stake through Gawker’s shriveled heart, and the one by the defamed frat boys of UVA against Rolling Stone. I’ve won big libel recoveries for plaintiffs, so it happens. It’s just rare, because it’s the hardest kind of civil lawsuit. And it should be. 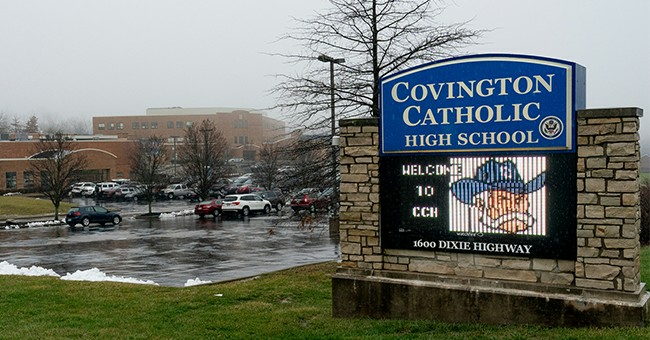 So, can the Covington Kids sue? The short answer – yes. Well, that’s actually not much of an answer, because as Eugene Grace, the guy who taught me how to try a case, used to say, “To sue someone all you need is a filing fee and a typewriter.” I’m that old. Anyway, the problem is getting up to the point where the jury finds for the plaintiff…and then getting the appellate court to uphold it. The first question is who do you sue? Nathan Phillips? I’m guessing he’s not a particularly deep pocket. Plus, he’s just another fringie activist guy. People are annoyed with him now; you sue him and you look like you are picking on a sad old man. Sue Twitter, for letting those poisonous lies proliferate? That’s challenging, for several reasons. But while it is awful in many situations, here its role was mostly as a forum. A forum for garbage, but a forum nonetheless. Yeah, the hypocrisy of allowing liberal blue checks to spread their murder fantasies unimpeded while banning conservatives for innocuous comments is galling, that’s not the real issue here. The real issue is the whipping up of a bloodthirsty frenzy against these kids based on what people knew were lies. That means the media and the Twitter blue check sociopaths who ginned up this frenzy. But this claim fits uneasily into the legal framework we have today, which is one that predates social media mobbing. Traditional libel is a written derogatory statement of fact that is false and causes damage. There are lots of bells and whistles about it (public figures have different rules than regular folks – this is one situation where the famous have a disadvantage compared to Normals) but those are the basic elements. But does that work here? A defense attorney will characterize the garbage takes of the media, the lefty blue checks and hack celebs as “opinion,” not fact. Remember, an opinion is not actionable. A statement of fact is. “I think you’re dishonest” is different from “I think you robbed the bank.” One test is if it can be disproved objectively. For instance, you could say “CNN is terrible.” That is an opinion, and it’s not one that can be proven objectively – there is no way to measure being “terrible,” at least not yet – NASA scientists are hard at work on the “Lemon-Stelter Scale” to measure awfulness, so maybe someday. And damage is an issue too. Traditionally, except in certain cases, you have to show a monetary loss. But how do you do that for teenager crucified on the web? There may be ways to fit the facts of this social media lynch mob inside the traditional libel framework, but is this really even libel as we knew it before the web? You print a newspaper article falsely saying Joe Schmoe is a drug addict and people talk and that’s bad, but this is calculated, weaponized lying using deceptively edited video designed to destroy any future these kids might have. In 50 years that poor dude who had the “recon ranger” drumming in his face will still have these garbage lies come up when someone searches his name. Do we as a society want to countenance people ignoring contrary evidence that is readily available to them to destroy the lives of kids to fulfill their creepy agendas? What happened here is more than just libel (though I think it is libel). It’s also a mixture of invasion of privacy and probably a civil rights violation in terms of them being targeted for their race, their religion, and the political expression manifested by their headgear. Liberals love to say the Constitution is a living document, which is stupid because they are stupid, but the case law as set down by court precedent? Well, that does evolve. And if you get the right venue – like, I dunno, Kentucky – and survive a motion to dismiss (though Kentucky has no anti-SLAPP statute) and you put this behavior in front of a jury well…remember Gawker? You go after the media targets, the ones who you can prove – via their tweets and news reports – knew the truth but didn’t print it to support their agenda. You find the Twitter trolls who circulated these lies and then find out their paymasters. And you find the blue check psychos demanding these kids be murdered for their race, religion, gender, and the baffled smile, in the face of the abuse that these liars hid from their audience. It’s a new age. It’s brought forth new atrocities. We need to decide as a society whether we are going to accept this dreadful phenomenon or stamp it out by making the perpetrators pay. If the old legal framework cannot right this wrong, then we need to create a new legal framework that will. And you do that by suing the hell out of them. I write about the kind of America these liberal lynch mobbers want in my latest novel, Wildfire, and in my earlier installments People’s Republic and Indian Country. We better draw the line now, or these sociopaths might just get real power and then there is no turning back.